Community gardens have gone through a recent resurgence in popularity thanks to renewed interest in locally grown and produced foods. Contemporary cities have developed a strong preference for the boutique and artisanal over the mass-produced, and an interest in understanding the providence of the things they buy. The benefits of growing produce locally and ‘shopping small’ are many and varied, and though as a society we will always rely on large-scale agriculture and industry, this return to the small scale can only be positive. 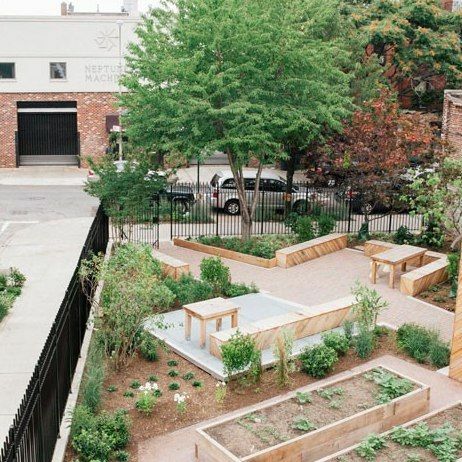 Community gardens enable people to connect with their food and to develop an understanding of food crops and how they grow. Learning about the requirements of crops, seasonality of different fruits and vegetables, and the complexities of agriculture even on a small scale, can foster healthier and more responsible attitudes towards consumption. Understanding more about how our food is grown and the amount of land, energy and resources that go into food production encourage people to consider the choices they make and how these impact the environment. Public vegetable gardens and verge gardens furthermore contribute to creating a sense of community, and help activate public space by getting local residents outside and working together. The small-scale movement has also resulted in the renewed popularity of the productive home garden. These were quite commonplace until the post-war years, when mass-production and mass-agriculture really took off. Perhaps it is because we have since become so distanced from food production that we now idealise and yearn for the romantic, bucolic, ‘living off the land’ lifestyle. From a design perspective, vegetable gardens can be a highly attractive addition to both contemporary and classic gardens. Many fruit- and vegetable-producing plants are quite ornamental, including citrus, artichokes, and herbs. These can be incorporated in balcony pots or amongst other ornamentals in a garden bed. Edible plants also encourage garden-owners to actually make use of their outdoor space, rather than simply observe it. Some plants are easy to grow and very rewarding in their production of fruit and vegetables, such as citrus, tomatoes, sugar-snap peas, leafy greens, and herbs. And while these won’t drastically reduce your food bill, getting outside to pick your own home-grown fruit & veg will be a reward in itself.